thought something else was going on, but instead of doing something we just asked to go on at 8pm. Not very punk! Then one day, after we’d played a slot at The Beachcomber pub in Seaford we were enjoying an after match pint and chat when Michael (our drummer) was asked to drink up by his support worker. To be fair it was getting late, but Michael still had half a pint and it slightly spoiled what had been a triumphant night for us. At that time it was a huge deal for us, taking our chaotic performance to a packed pub of people who were largely not at all aware of the disability arts scene. And it was like one of those scenes in a Hoolywood feelgood film where the audience just looked shocked and confused for the few songs, and by the end Simon had roused the entire pub in to waving their arms over their heads and singing along. It was a fantastic moment for us. So Michael being asked to drink up and go home took the shine off it. That was when we decided enough was enough and something needed to be done about it. But what could we do? It wasn’t until a few days later that I remember thinking, ‘hang on a minute, we’ve got a film crew following us round. If we did something it would be in the film!’ So maybe we were a bit slow on the uptake with starting something but we went on to build a campaign which was featured in the movie and the response was amazing. People all over the UK said they were experiencing the same frustrations as us, and what was more was the people without disabilities who’d never considered that this would be an issue. 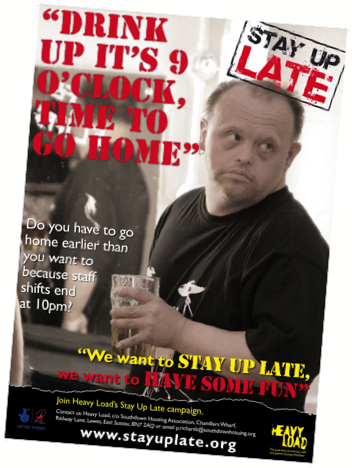 We’d found a huge number of people who also shared our belief that it was a fundamental right that people with learning disabilities should be able to lead the lifestyle of their choosing and have an active social life. You can see how it all started here, as the movie is now on Vimeo in glorious HD, along with the short film about Heavy Load’s adventures in New York, and an interview with director, Jerry Rothwell. Click on the movie poster to go to Vimeo on demand. It costs $4. Of course if you want the DVD we’ve still got some (PAL and NTSC) so get in touch.